When doing my usual social media work the other day something occurred to me. Something that I feel needs to be said. In today's day and age of the world wide web, I feel we don't go a day without studying numbers. Whether it be Twitter followers, Instagram followers, blog comments, items sold, people reached and so forth, numbers consume us. You don't even have to be a business woman, YouTuber or blogger for these numbers to effect you, everyone is on social media, everyone can be effected by the number of likes, or lack thereof, on something they post. I know for us bloggers we like to set goals for ourselves, how many Bloglovin followers can we get? Can we build up our Twitter audience and gain more followers? Seeing the number go up and down can be like a little roller-coaster of emotion each day. How many of you have felt a little pang of sadness when a post doesn't get a heap of likes? How many of you have felt frustrated when your subscriber count reaches a Plato? How many of you sometimes feel like the uncool kid in the corner if your Instagram number drops a little? I have to be honest with you and say, I have those days and I have felt all those things. You might be thinking I'm crazy and rolling your eyes at me right now as if to say 'DUH, what's that supposed to mean? I know I'm not a number.' but I felt I had to say it. You are a human. The numbers on the screen have no effect on your talent, your ability to be kind, your ability to make people happy, to smile, to spread love. Think about all those around you, the people you interact with on a day to day basis, your family, your friends and yes, even the people you have made friends with and actually speak to on social media, and remember how you can impact their lives. Be a friend, a sister, a mother, a daughter, a brother, a son, a partner, be in the moment and focus on the world around you, don't let that little number on a screen effect your confidence and who you are. No one is better than you because they have a million followers. No one is cooler than you because they get more likes. No one is prettier than you because brands want to work with them. No one is you!!! Furthermore, when it comes to reaching out, setting goals and possibly wanting to work with companies through a social media platform, never feel not worthy because of a number. I do understand the logistics of 'more followers equals more influence' but at the same time that number has no effect on your creativity. Show people what you are made of, always strive to be you and show what you are capable of no matter if you have one person following you or one hundred. And hold your head high and say screw you to people who would dare make you feel any less of a person based on a number. We all need to be given chances and opportunities. We all need to have a little faith and stand behind people, lift them up and allow them to grow. The people who see that are the people you stick with. In conclusion, it's OK to make goals, of course it is. 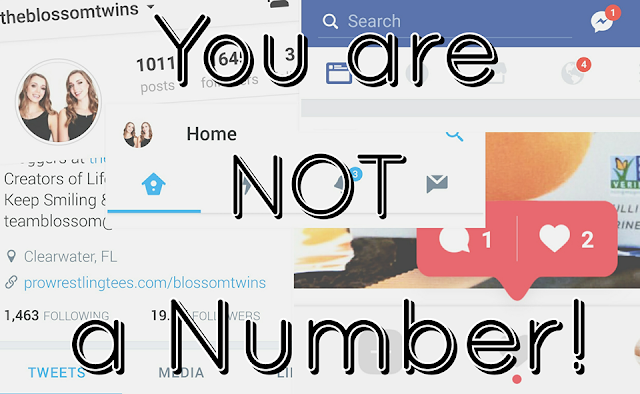 It's understandable to want to reach more people and progress, but please in today's social media society, never let that number make you feel anything other than the awesomeness you are. Never let it control your positive energy or the way in which you feel about yourself or how you treat people. Lucy, this post literally literally literally came at just the right time. I've been stuck indoors lately because of the rain (love the rain but you know, sometimes a lot is a bit much) and so I've been devoting a lot more time to blogging/social media but at the same time, while recently I saw an increase in traffic, this week was different than last and I finally had to admit to myself that the traffic isn't going to be steady especially on days when I can't devote myself. Even if I devoted myself 24/7, it's still going to be unsteady because there's tons of creatives out there. So that's when the whole comparison state of mind sank in and sometimes I wonder why I do what I do and when I really thought about it, it's simply because I love it so much. I don't care if I only have 3 readers, I cherish them and give me a purpose to be creative and look forward to the future. I don't care if brands aren't lining up to work with me simply because I don't post much about makeup or world travel, but I'm doing me and I feel really okay with that.